I am unquestionably an anglophile. I love tea, and Wensleydale, and scones with jam and cream, and shopping at Marks and Spencer’s. I am an avid reader of Shakespeare, Jane Austen, and Noel Coward. My favourite key-ring is a red London double-decker bus I bought last year at the Westminster Abbey gift shop. I watched Prince William’s wedding to Kate Middleton on TV from start to finish with as much enthusiasm as any Brit, and I have only very rarely been heard to refer to the English as “Les Rosbifs” (the French pronunciation of “roast beef”). However, I’m afraid I draw the line at Union Jack biscuit tins and mugs/dishtowels/notebooks stamped with Queen Elizabeth II’s crowned head in assorted colours. I am too French to regard the current Rule Britannia craze with anything other than raised eyebrows. So, no disrespect meant to my British friends, but I didn’t string my balcony with bunting or watch the Diamond Jubilee celebrations on TV this weekend. The Queen is a doer, not a thinker. She doesn’t have time for hobbies or for pleasure. Duty is the ruling precept of her life and reading is definitely not something that has a place in her schedule. But a chance encounter with the Westminster City travelling library and a lanky ginger-haired kitchen skivvy unexpectedly turn her world upside-down. Late in life, the Queen discovers the pleasures of reading and her appetite for books is soon insatiable. All of a sudden, she finds herself cutting short an interview with her personal secretary in order to finish a chapter, or hiding a book behind the carriage cushions on her way to Parliament. Her entourage does not take kindly to this new eccentricity: equerries, ladies-in-waiting, and the president of France become increasingly disgruntled as the Queen upsets their routines and starts asking awkward questions about their own reading habits. Little do they know that the Queen has one last trick up her sleeve and that the greatest surprise of all is yet to come. 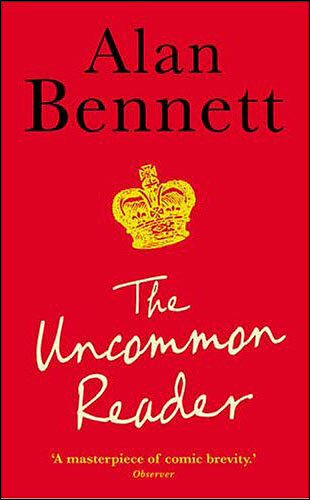 Through the improbable but charming story of the Queen of England’s late-blooming love-affair with books, Alan Bennett explores the transformative power of literature and cleverly brings to light, through the inner journey of one decidedly uncommon reader, both the uniqueness and the universality of the reading experience. Flawlessly paced and pitch perfect from start to finish, Alan Bennett’s novella is a tour de force of British humour, each deadpan, tongue in cheek remark slyly concealing a gentle satire of the royal household. It is the most delightful reading manifesto a lover of books and the English language could ever hope to savour. This entry was posted in Book Reviews, Fiction and tagged books, Diamond Jubilee, Queen of England, reading. Bookmark the permalink. This has been on my To Read list for a while. The premise sounds so fun! This is one of my all-time favourite books. Oddly enough, earlier in the year, I also offered this up as an alternative to the Jubilee brouhaha and, silly though it sounds, I knitted her (adapted from a pattern in Knit Your Own Royal Wedding) with a book and a crown, and posted a picture on my blog today. How’s that for co-incidence! I love this book! It is so clever and quirky. I recommend it quite a lot at the library and everyone I’ve suggested it to has loved it as well. The Diamond Jubilee wasn’t huge news here in the States, but the concert was broadcast and I did watch some of it.